What is the patellofemoral pain syndrome (PFSS)? The term patellofemoral pain syndrome (PFSS) is used to define pain in the patellar groove between the thigh and the kneecap. Patients with this syndrome mostly describe pain next to, behind or under the kneecap. The pain mainly occurs when climbing stairs, after long periods of sitting or in connection with sporting activities. Young active sporty women are affected particularly often. 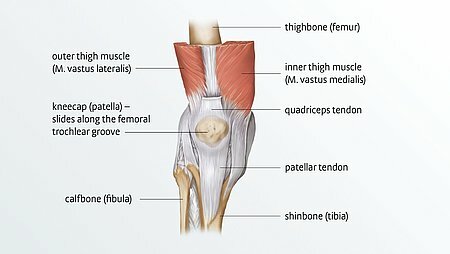 The most common causes include shortened or weak muscles over the front of the thigh, an incompletely formed patellar groove, a malaligned leg axis (e.g. knock knee or bowleg) or tilting of the patella. In a healthy person, the kneecap sits in the so-called femoral groove like in a guide trough and it is also held in place by ligaments on each side. The muscles actively support the patella in gliding along the centre of the groove. If the kneecap is unstable, it no longer runs exactly in the femoral groove and, in the worst case, it "jumps" out of the guide trough. This is very painful. The cause of the symptoms usually lies in an unfavourable combination of components that predispose to dislocation. From the anatomical viewpoint, these include anomalies of the patellar groove or the shape of the patella. Other risk factors include a lax ligamentous apparatus (hypermobility of the kneecap), a high patella and an imbalance between the inner and the outer muscles over the front of the thigh. The latter condition can lead to a situation, in which the shortened muscles pull the kneecap to the side over the tendons. The result: instability of the kneecap. Healthy muscles contract and relax again. Overstrain can lead to the outer thigh muscle first contracting permanently and then shortening. This can result in the formation of trigger points that cause local and radiating pain. Thus symptoms in the knee can also be associated with the formation of a trigger point in the outer muscles over the front of the thigh. The pain is felt behind, next to or under the kneecap. Symptoms onset above all after long periods of sitting or resting the knee joint (start-up pain), but also in connection with sporting activities or when climbing stairs. Young active sporty women are affected particularly often. Imbalance between the inner and the outer muscles over the front of the thigh – the shortened muscles pull the kneecap to the side over the tendons. The result: instability of the kneecap. With the right exercises, you can stay fit and mobile and prevent pain. In particular, you should strengthen the muscles over the front of your thigh with regular training sessions on your own, which will have a positive influence on the direction of pull on the kneecap. Click here for helpful exercises. Most cases of lateralisation or subluxation of the kneecap are treated conservatively, i.e. without an operation. The patient wears a knee support (for lateralisation) or a knee orthosis (for dislocation) to stabilise the kneecap and the knee joint. If the kneecap dislocates once or even several times, an operation may be considered. It is also important to correct the direction of pull on the kneecap. Physiotherapy exercises and regular training on your own, help to strengthen the muscles over the front of the thigh. Click here to download a poster of a tried-and-tested training programme for the prevention and treatment of anterior knee pain. Hold an exercise ball at knee height between your legs. Bend your knees and hips. Perform 3 sets of the exercise with 10 to 15 repetitions per set. Take a 1 – 2 minute rest between the sets. Keep your heels on the ground at all times during the exercise. Tie the exerciser around a table leg (loop approx. 30 cm long). Sit on the table and place the loop around your ankle. Your legs should be bent at an angle of 90°, but don't let your feet touch the floor. Point the tips of your toes upwards. Straighten your leg by about one shoe length and then return your foot to the starting position. Stand next to a chair you can hold on to securely. You will be exercising your standing leg in this exercise. Now straighten your standing leg. Slightly bend the knee of the other leg. You can bend your hips slightly. Tie the exerciser into a loop approx. 30 cm long. Lie on your side (with the leg you are exercising uppermost). Slip the exerciser around both ankles. Lift the upper leg up slowly against the resistance of the exerciser. Now lower the upper leg – but make sure the exerciser remains under tension thereby. Place ‘obstacles’ (approx. 20 cm high), for example books, alternately in front of your left and right legs. Stand up straight in front of the obstacle course. Lift up the first leg and walk over the first obstacle. Repeat this procedure with the second leg. Do not bend your hip sideways when walking. Stand straight close to a chair or table you can hold onto. Make sure you stand up straight and avoid a hollow back. 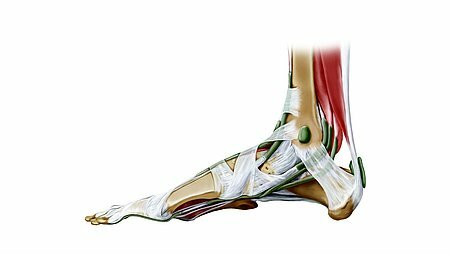 Bend the leg you are stretching and grasp your ankle. Pull your heel up towards your bottom until you feel the stretch. Hold this position for 30 to 45 seconds, repeat the exercise three times. Relax and shake your legs briefly between each exercise. Lie on your side with the leg you are stretching uppermost. Move the other (lower) leg forwards and bend it at the knee to an angle of 90°. Bend the upper leg backwards. Stand up straight about 20 cm in front of a table. Place the leg you are stretching (bent to about 90°) on the table. Now bend your upper body forwards until you feel a stretch. Stand upright in front of an exercise stepper (alternatively stairs, wooden crate etc.). Keep your feet a shoulders' breadth apart. Keep your standing leg straight and lift your pelvis on the side of the swinging leg. Step up onto the exercise stepper (leaning forward slightly and with your leg bent), then lift your other leg up onto the exercise stepper as well. Perform 3 sets of the exercise with 10 repetitions per set. Take a 1 – 2 minute rest between the sets. Slightly bend your standing leg and lift your pelvis on the side of the swinging leg. Now step down slowly from the exercise stepper with your swinging leg. Make sure that the knee of your standing leg does not turn in- or outward. Stand up straight with your feet on the floor. Stand with your feet a shoulders' breadth apart. Bend the leg you are exercising and slowly transfer your weight to your front foot. Make sure that the knee does not turn in- or outward. The leg you will not be exercising is the leg you're standing on. Bend your swinging leg and lift your hips / your pelvis as high as possible. Stretch the bent leg out straight ahead of you. Transfer your weight forwards onto your front standing leg. Genumedi PT – relief with the smile principle: Genumedi PT effectively relieves anterior knee pain. With the smile principle, it acts directly on the cause of the pain – without any side effects whatsoever. An imbalance between the inner and the outer muscles over the front of the thigh is often seen as the cause of anterior knee pain. While the outer muscle often becomes tense and shortens, the inner muscle tends to grow weak. 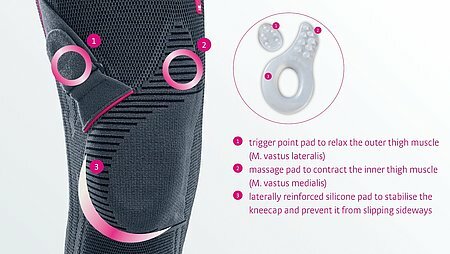 The silicone cushions on the Genumedi PT have a specific action, through which the external thigh muscle becomes relaxed as a result of the response of the trigger point it targets. At the same time, the inner muscle is activated with the help of a pad. The result: the missing balance between the muscles is restored. The laterally reinforced silicone ring also guides the kneecap to keep it in a central position within the femoral groove. The ‘smile principle’ consists of three important components. If we trace over these components, a laughing face emerges, which perfectly illustrates the aim of the Genumedi PT: you should soon be pain-free and smiling again. Click here for more information about the Genumedi PT knee support.